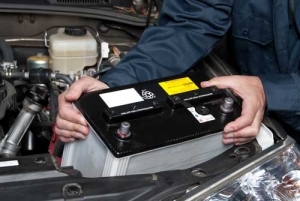 Your car’s battery provides the power to run all its electrical devices. Two cars come into a repair shop: One won’t crank or cranks really slowly when you turn the key; the other starts fine but the transmission operates erratically. Truth is, there’s no way to tell yet. It could be both or it could be neither. The one that won’t crank? That could be due to a bad battery, or maybe it’s just low on charge. Or it could have dirty battery cables, a bad starter… in fact, there’s a whole list of things that could mimic a bad battery. That’s because today’s transmissions are heavily computer controlled. They depend on a clean electrical signal to operate properly. If the battery’s getting a little iffy, it could easily cause erratic shifts or poor gear engagements, even though the starter seems to crank properly when you turn the key. So how can you tell what’s really causing the problem? You can’t; not without a thorough examination of your car’s electrical system. That’s where your friends at Cottman can help. Their highly trained technicians are equipped with the latest diagnostic equipment to examine the battery, starter, and alternator, to root out those hard-to-trace electrical problems, and make the right diagnostic recommendations… the first time. So, if you’ve been noticing a problem with your car — whether you think it’s as simple as a bad battery or as complex as a worn transmission, the smartest choice you can make is to bring your car to Cottman for a complete electrical system checkup. To speak with someone about your specific problem or to make an appointment for your car or truck, find your local Cottman location!